This chic Citizen ladies' watch ticks all the boxes, with innovative Eco-Drive technology, this timepiece pairs fashion with functionality. A classic black dial presents rose gold tone hands and hour markers, co-ordinating beautifully with the rose gold plated case and bracelet. Set to sparkle from every angle, genuine Swarovski crystals are set upon the bezel, casting a sophisticated shimmer. 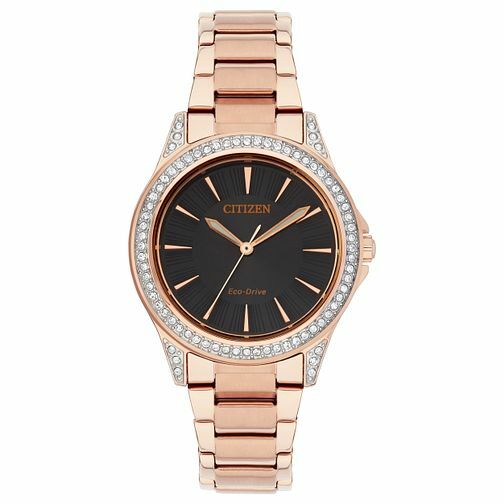 Citizen Eco-Drive Ladies' Rose Gold Plated Bracelet Watch is rated 4.8 out of 5 by 4. Rated 5 out of 5 by Anonymous from Beautiful Ladies Watch. This is a stunning watch. Great value for money and fantastic service from H Samuel. Everything worked like "Clockwork" and was so efficient starting with ordering online and collecting from our local shop where the staff were lovely and adjusted the strap to fit my wife`s wrist perfectly. Would highly recommend H Samuel for a quality product and quality service. Well done.